Hartmann family photo of 1936. Button made for family reunion 2016. 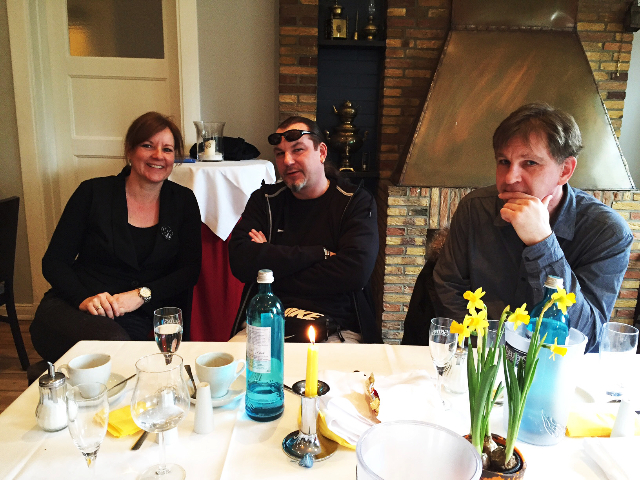 Photo courtesy of Landhaus Ohlstedt. 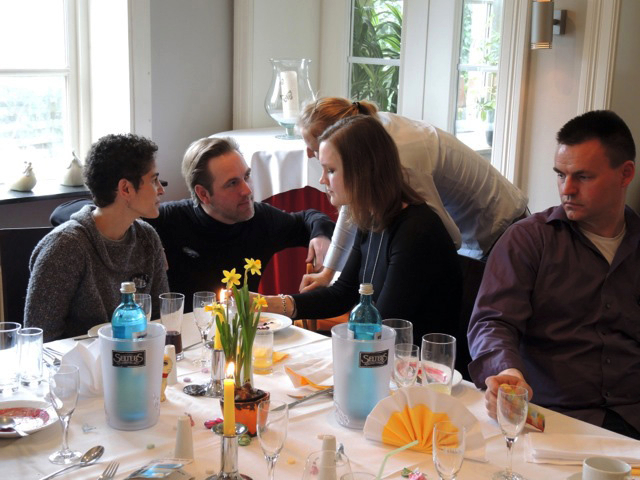 Jule, Dirk, Kai and Emma - and a beautiful table setting. 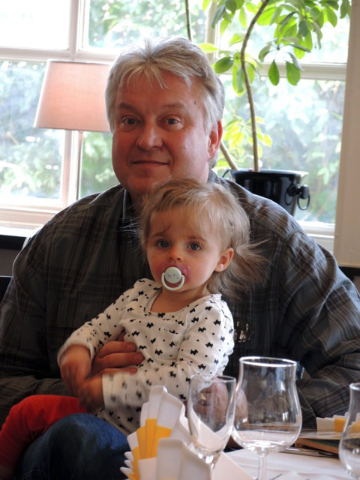 Dirk and youngest, Jule. Photographers: D. Hiemer, E. Ungvarsky, G. Solbach, Y. Wegemann, D. Müller, A. Hiemer. 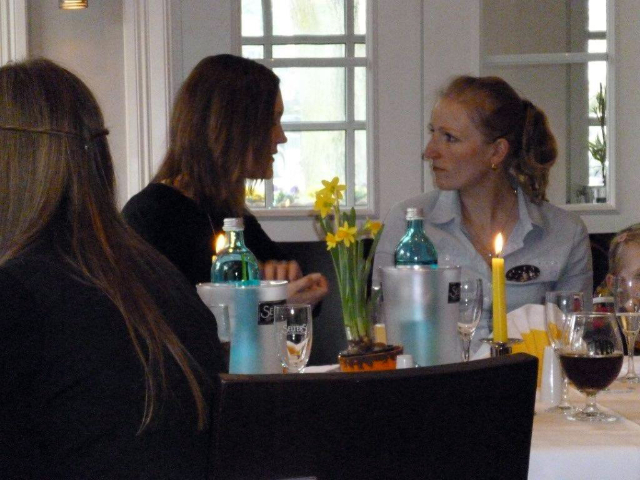 Steffi and Mareike in conversation. Horst and Margot, our Guests of Honor, in center. 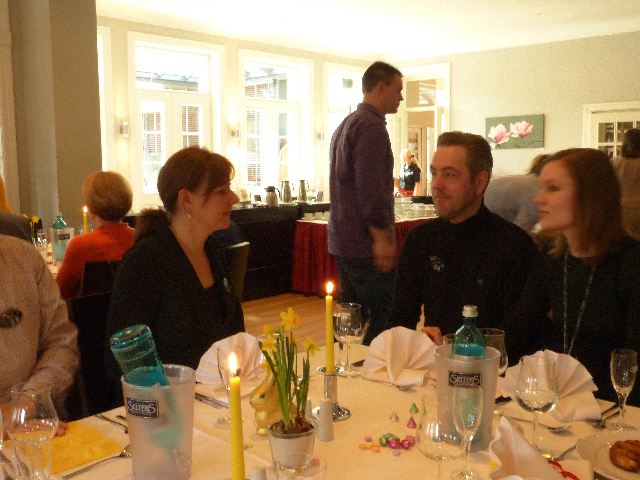 Claudia Müller, in white, standing in background. 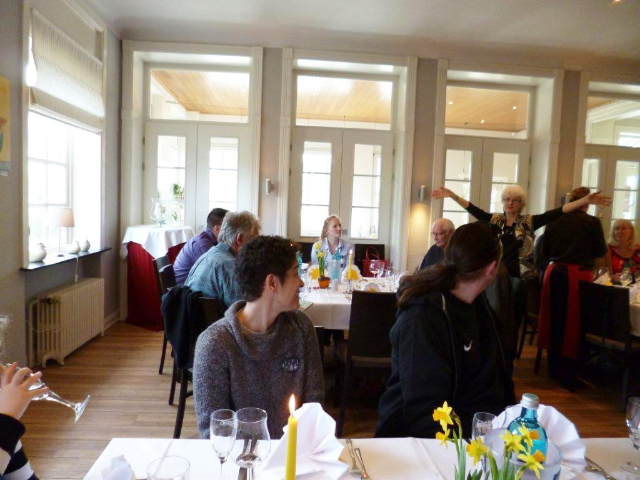 Marek, Barbara, Astrid, Arnö, Detlef and Horst standing. Yvette, Thomas, Stefanie and Kai standing. Three sisters: Britta, Claudia and Yvette standing. Finn, Johanna, Piet and Brandon with blue hair. 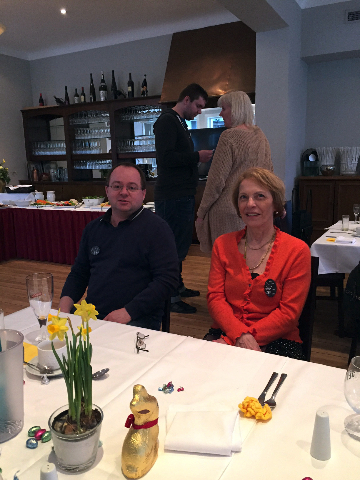 Marek and Barbara; Robert and mother Gaby in back. 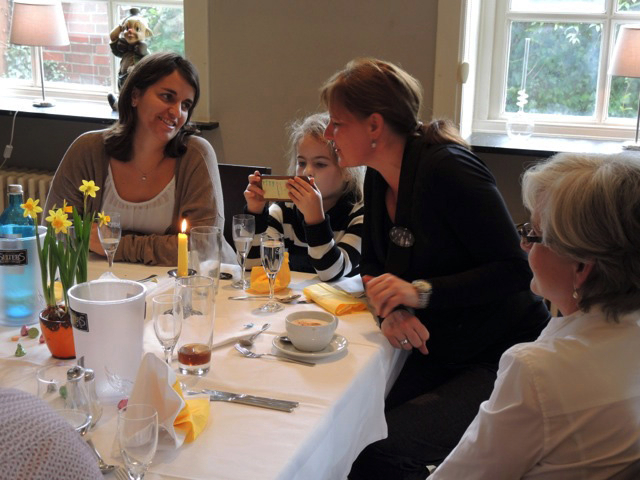 Saskia in center with daughter Amelie; Ed and wife Olivia in motion. Sassi, Amelie, Yvette and Traudel. 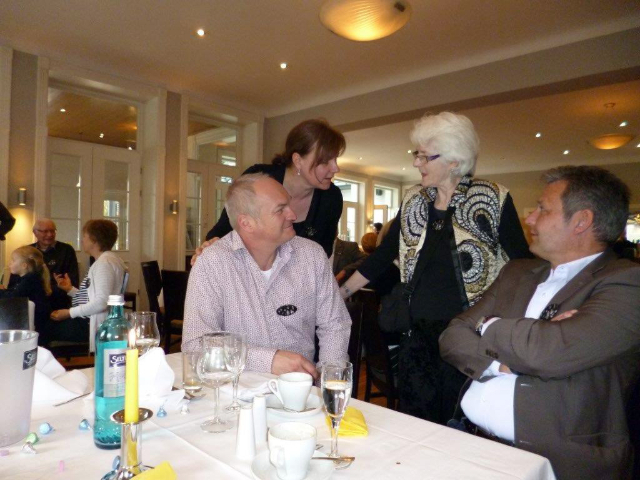 Husband Bernd, wife Yvette, Astrid and Carsten. Our family: Ed, Olivia, Nola, Astrid with Steffi. 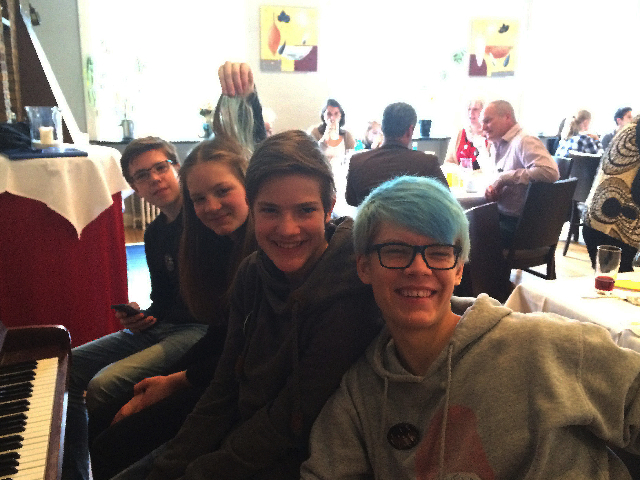 Olivia, Thomas, Steffi, Mareike obscured and Kai. 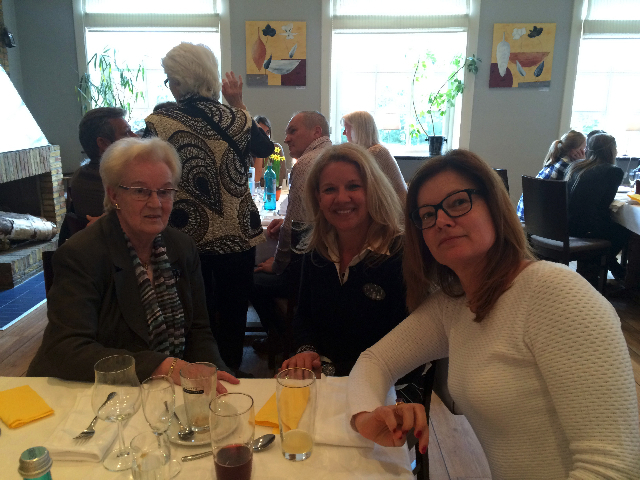 Margot, our matriarch, in conversation with Claudia and Britta. Olivia and Thorsten, another view. Invitation to assemble outside for the 2016 family photograph. 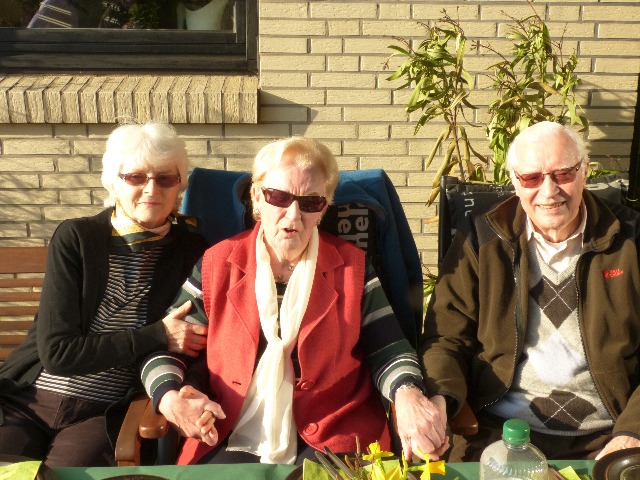 Margot and Horst Müller, our guests of honor, at the Family Reunion - with Astrid at a Müller barbecue. Photo: D. Müller. Olivia speaking with Thomas, then Ed and 3 families in background. Boys will be boys, so they say! A side view of half the families. 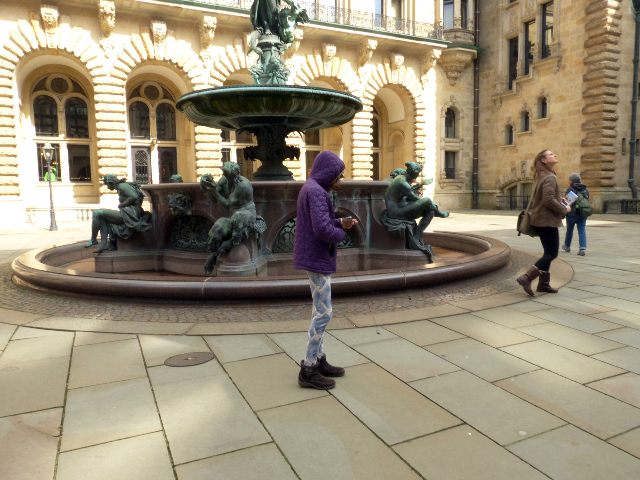 Court yard of Rathaus with Nola. This and following photos by A. Hiemer or otherwise noted. Hamburg Rathaus from court yard. The imposing Rathaus with expansive square. Jungfernstieg along the Binnenalster, the smaller lake. 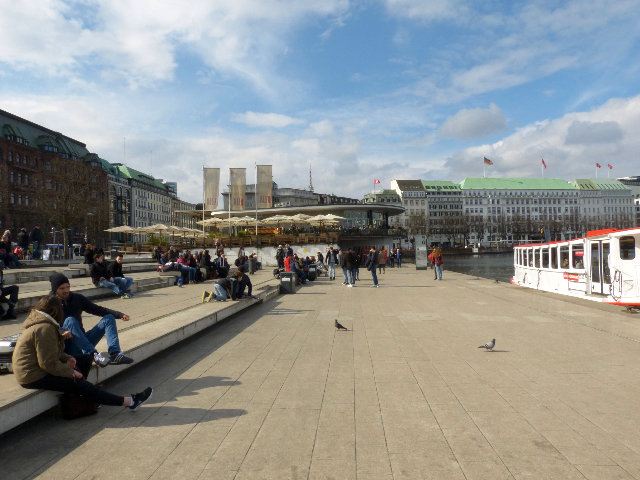 Alsterpavillion in the background as well as the green roof of the hotel Vier Jahreszeiten (Four Seasons). The Hiemer family lived in the middle building. Waiting for a U-Bahn, subway train. Photo: E. Ungvarsky. 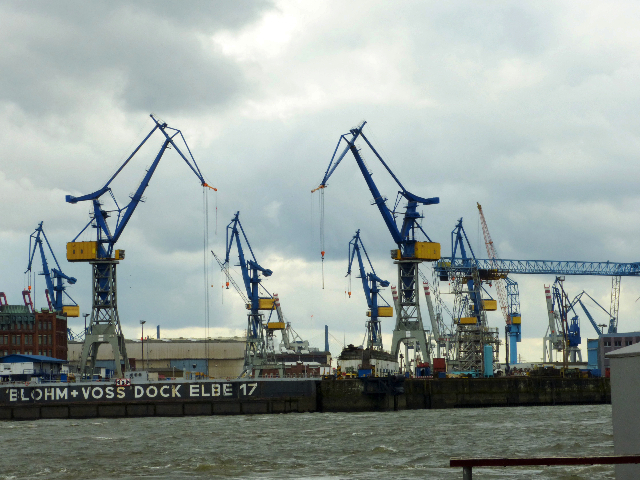 Ship yard: Blohm & Voss. 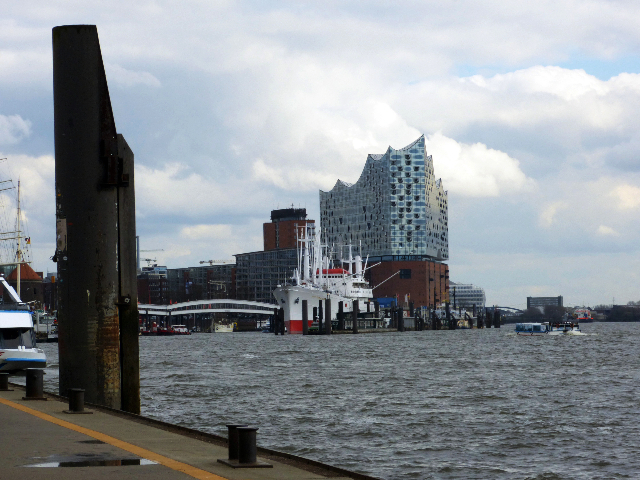 The new Elbphilharmonie is visible all over harbor. Looking into a tunnel with car arriving. Flounders, always a welcome meal. A view up many stories high. 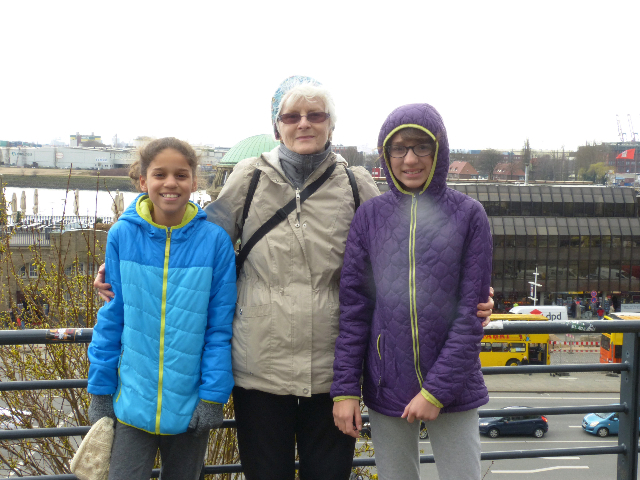 Lena, Oma, Nola - it's cold! Nola, Olivia, Lena all bundled up. A final view at historic Landungsbrücken. One of many fish distribution companies at Fischmarkt. 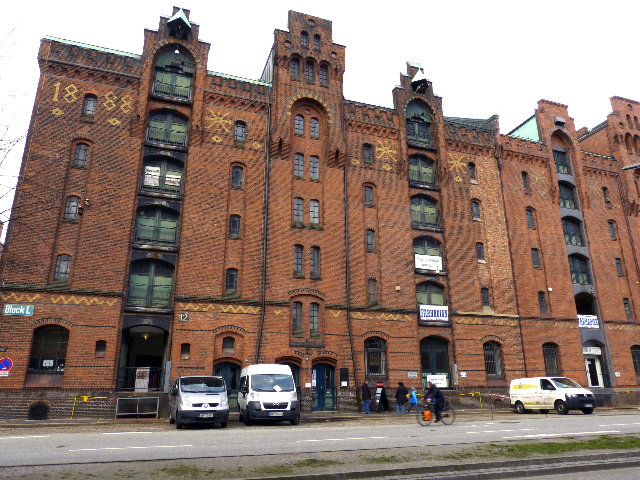 UNESCO awarded World Heritage Site: Speicherstadt Hamburg. 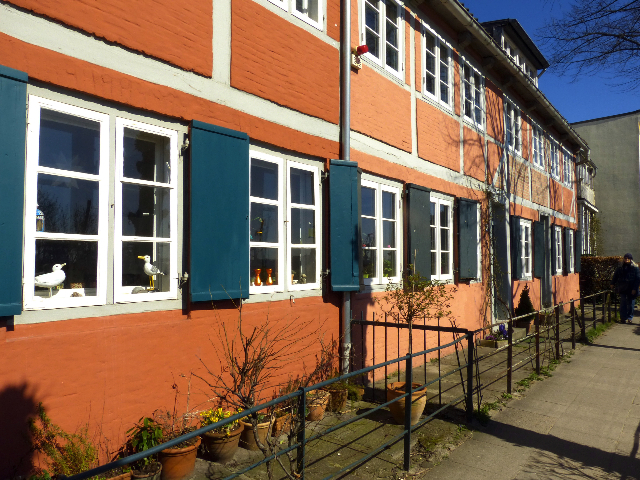 An other area of Speicherstadt. Neue City along a Fleet (canal). Extreme hardware to keep a dock afloat. 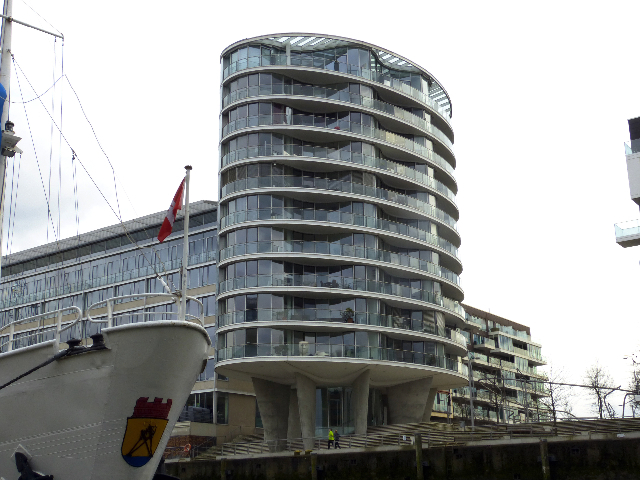 Another apartment block with ship nearby. A long view at the harbor. A view over harbor and community. First walk along the beach. 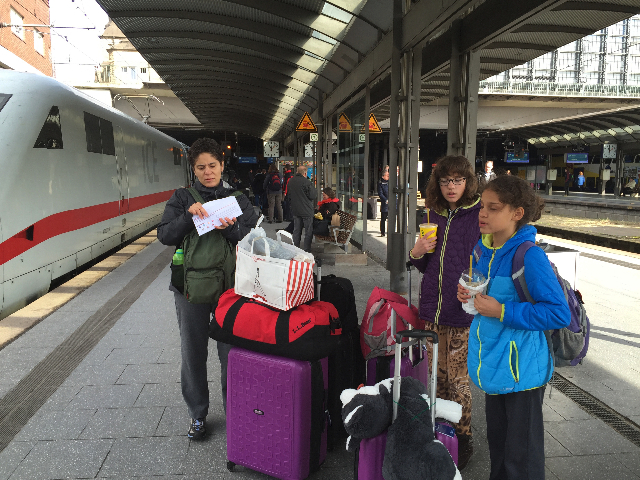 Family waiting for Intercontinental Train. Photo: E. Ungvarsky. 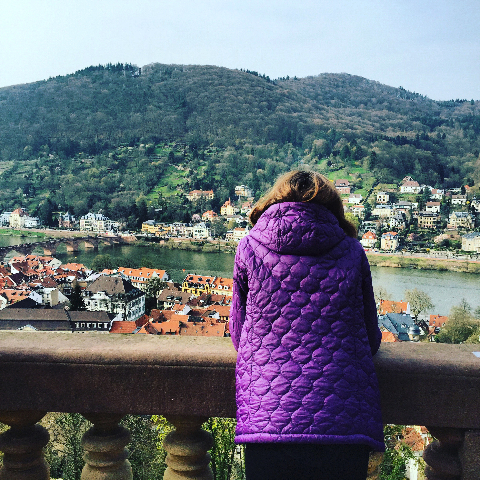 Nola overlooking Heidelberg. Photo: E. Ungvarsky. The lead photo depicts a button, made in America and the pins traveled with me in my suitcase. We had one button for each person at the reunion, wishing to remind us all that the family in the photo, the Hartmann family, came before us. We had a night in uproar, Lena (10 y) had gotten sick at 3 am and Olivia and I washed clothes and bedding as quickly as we could. Early in the morning we discussed, who might stay home with Lena or perhaps leave the restaurant with her, in case of need. Luckily we remembered that the restaurant was part of a hotel and so we reserved a room for a few hours. That was the best solution. 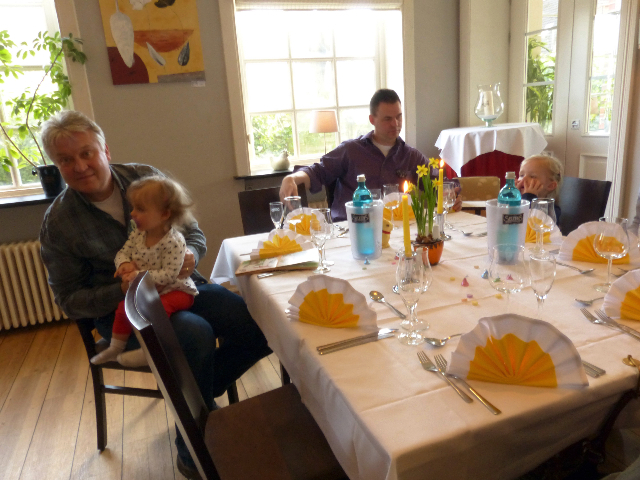 By 10 am we drove to Landhaus Ohlstedt, our family-brunch destination. The room and tables, including the buffet, were prepared beautifully with an Easter theme to which we added American Easter candy. Barbara Müller, my girlfriend since age two, contributed chocolate Easter bunnies for the tables. 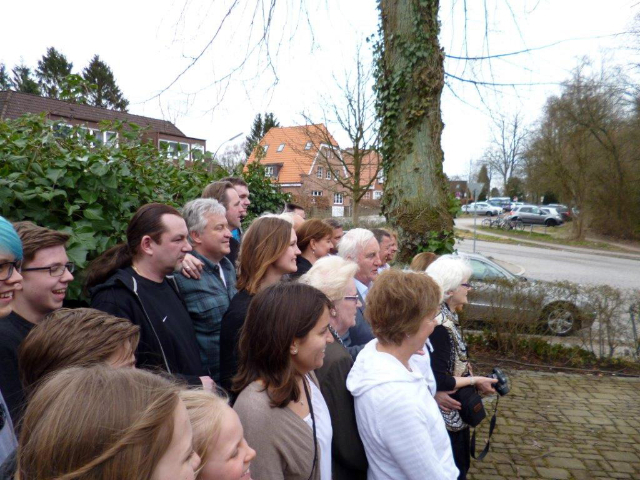 Then various families arrived all at once with big hellos and hugs and the buttons were distributed on arrival. The idea was to bring together symbolically all present and it seemed to be successful. 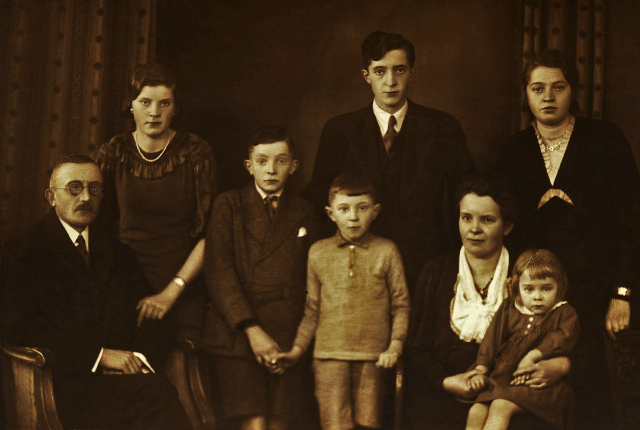 Of the Hartmann family shown in the photo of 1936 only the three girls married with children. The two older boys, Otto and Horst, died in WW II and young Günther married without children. Only Margot, the youngest in the photo on her mother, Dora’s lap, there three years old, is still alive. Franz Hartmann, my grandfather, can be seen on the left. 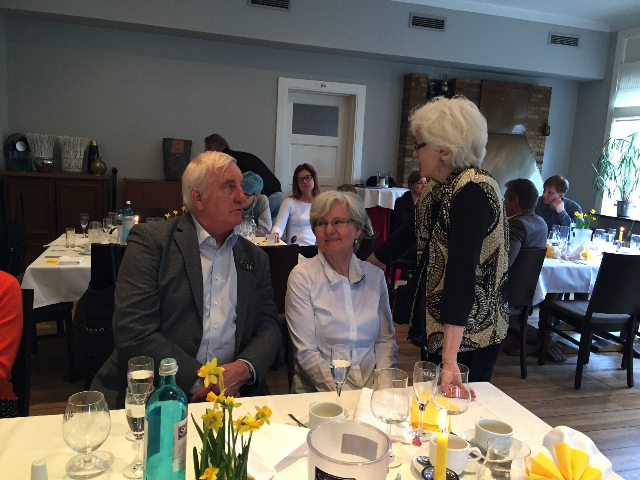 Margot and husband Horst Müller, now in their 80's, were our special guests at the celebration. She is today the matriarch of the family. Unfortunately, the Hartmann name has been lost. The two other young women in the photo, my mother, top left, married Arthur Hiemer and Gertrud on the upper right was married to Fritz Jonen. Following generations have multiplied in names further or kept their original family name, as Britta and I did. There we were, four generations wishing to deepen our connections and to get to know each other again across the ocean. Three hours went by too fast. We had suggested to sit with family members that are not quite as familiar, and so we played musical chairs and our conversations flew across the room. 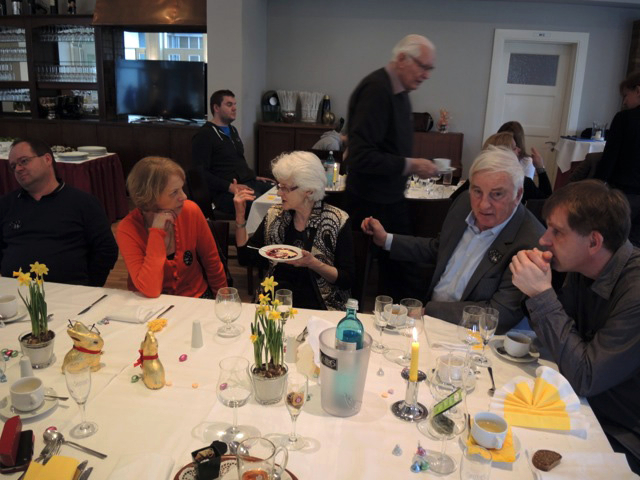 Missing at the occasion were Ursel Hiemer, my late brother Winfried's wife, Mira Hiemer, Detlef’s wife and Jaimie Hiemer, Thorsten’s daughter, who was on a ski-trip in Norway. And, how can I forget my own husband, Charles Giuliano, who remained at home in Massachusetts. 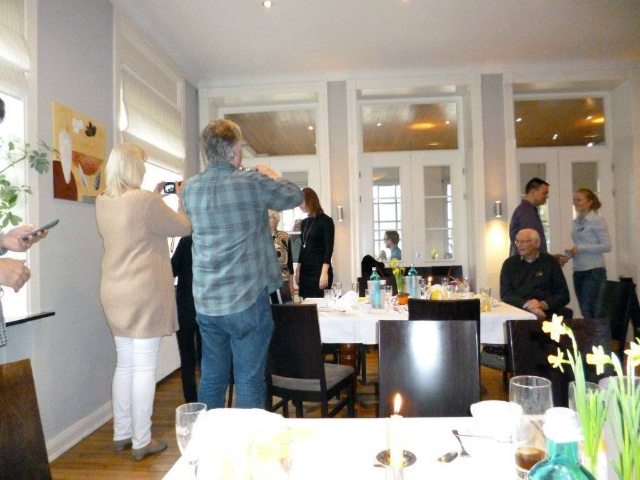 He had met many family-members in Hamburg during a trip approximately ten years ago. 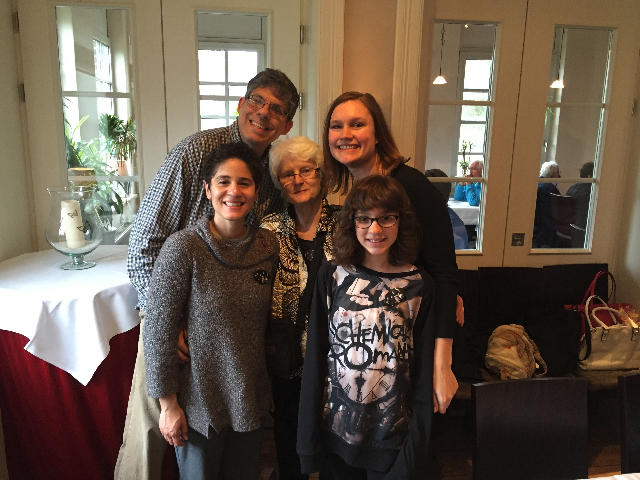 Thankfully, little Lena was cared for at the hotel by Claudia Müller and Ed, her father. She only emerged for the final photo session. 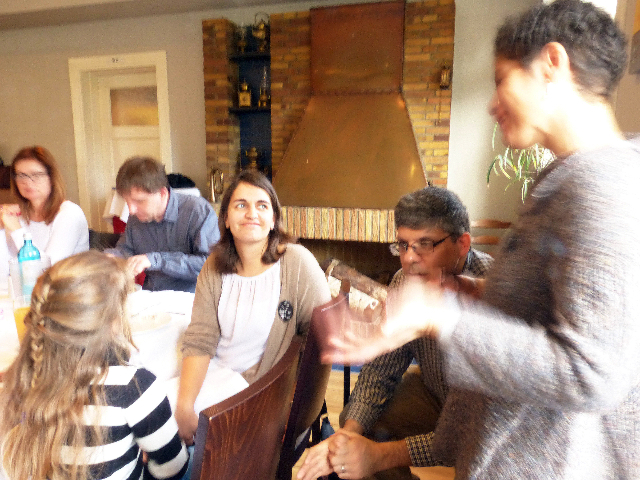 Many thanks to all the photographers at the brunch, who emailed their images. 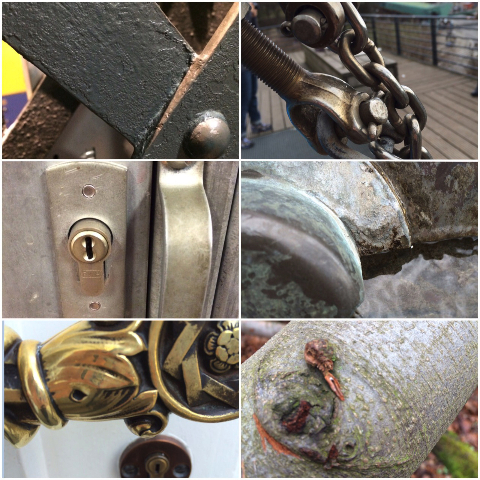 Many are now part of the attached photo series, a wonderful collaborative effort. Finally, before the extended family disbanded, there now is an official photograph of the current generations, who owe life to Franz and Dora. They had lived through two world wars. 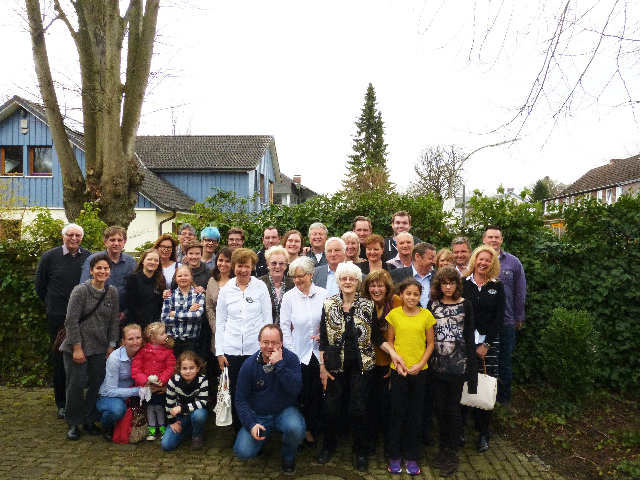 80 years have past since the Hartmann family-photograph was taken: 1936 - 2016. Lena, not quite recovered stayed home with Ed; so Olivia, Nola and I now comfortable with the U-Bahn system exited at the Rathaus (city hall) station. Hamburg’s stately Town Hall was rebuilt in late 19th Century after a great fire that destroyed much of the core of the city in 1842. 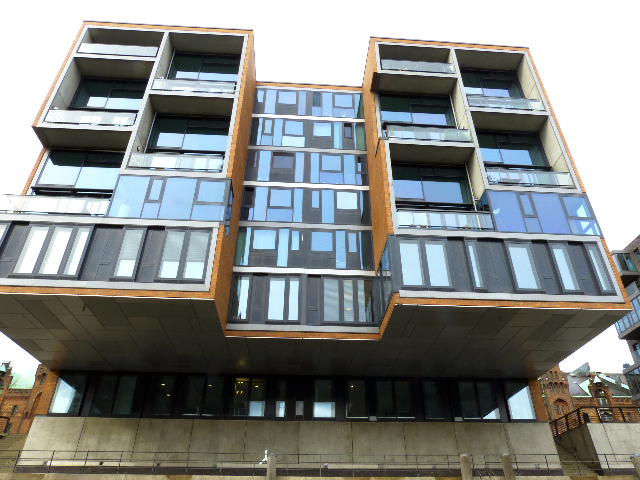 It is built on 4000 oak piles, actually a four-corner structure with inner courtyard. 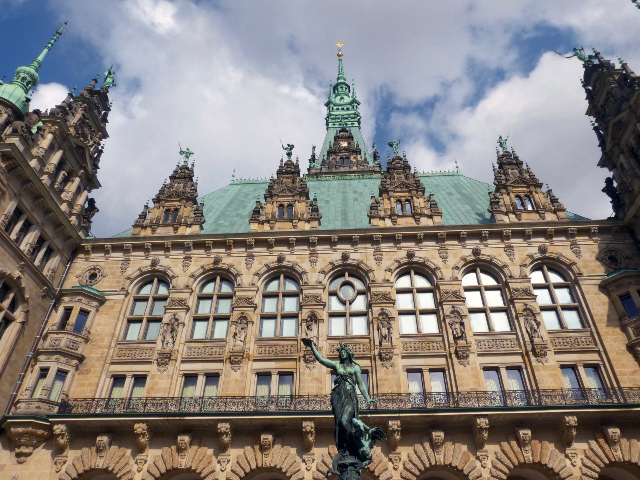 Hamburg has been a City State since the 13th Century, and so it houses its parliament as well as a ballroom and other stately spaces. We walked inside the busy Town Hall, then into the courtyard. The winter-dry elaborate fountain must be splendid, when active and classical music concerts are scheduled there during summer months. 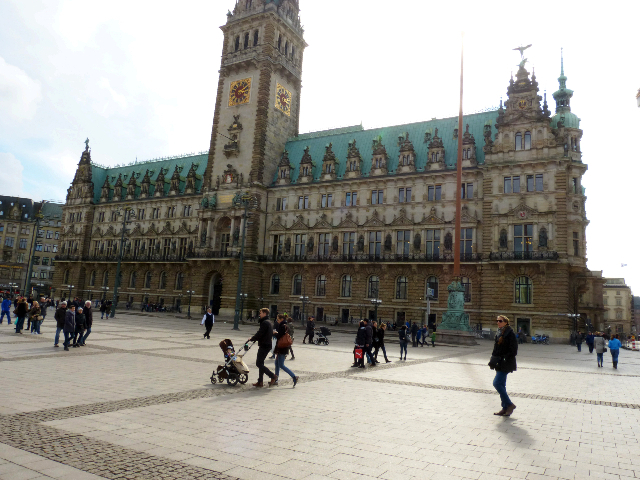 Hamburg’s immense Rathaus and its square, the Rathausmarkt, are clearly the center of town. I’ve always loved spending time at the big Rathausmarkt, where all kinds of events are scheduled throughout the year. Today, the square was empty, wintertime was still lingering. From there we walked along a canal and Alsterarkaden over to the Alster, the double-basin lake, smack in the center of Hamburg. During my youth there were winters, when one could cross the smaller lake, the Binnenalster, on ice. 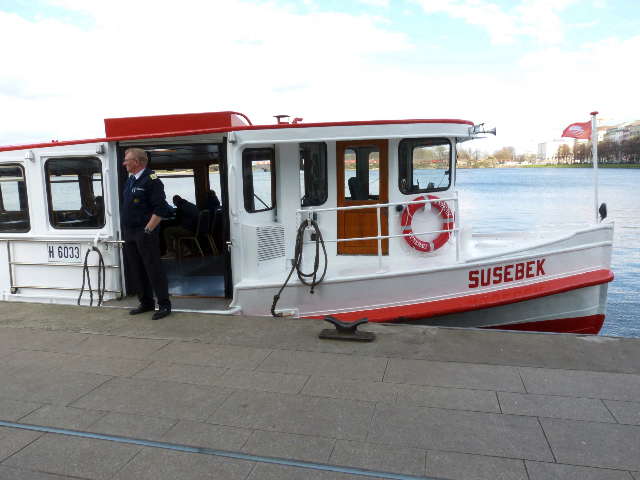 I took an Alsterdampfer, a regular ferry, from Jungfernstieg to Atlantic Hotel stop to get to college on time. Years before then, I would walk past the other first class Alster hotel, Vier Jahreszeiten, to my High School, the Sopie-Barat-Schule - oh, so long ago. 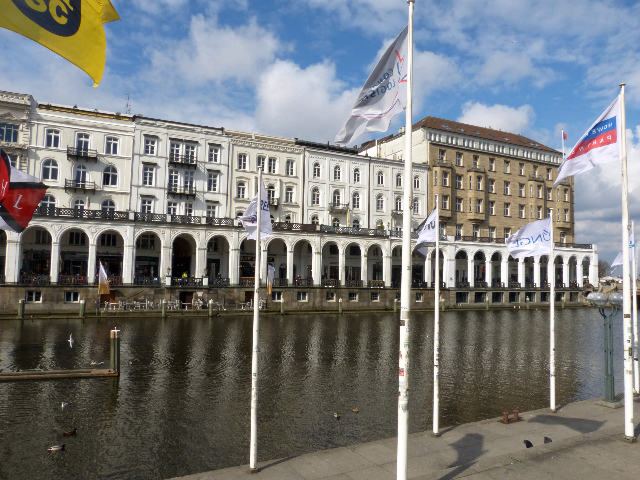 We walked along the promenade, then the Alsterpavillion, a 200 year old café and restaurant. 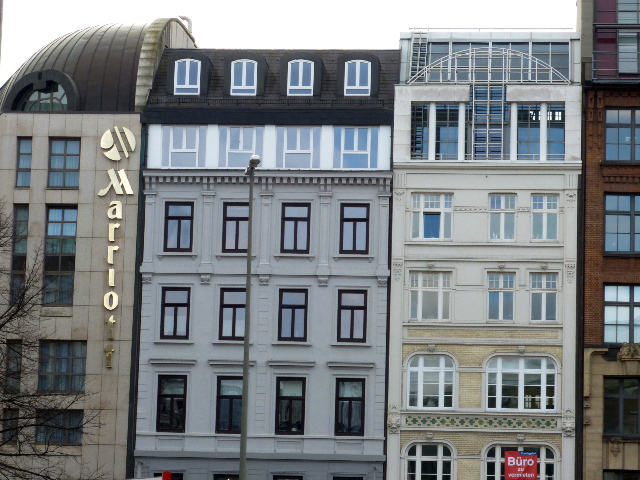 The area surrounding Jungfernstieg houses many exquisite stores and office buildings. Next, we reached Gänsemarkt (the goose market), the square where I grew up. The Lessing Monument of Gotthold Ephraim Lessing, theatre director in the late 18th Century, reminds of a time when Gänsemarkt provided culture to the city. I pointed to the building, next to the Marriott Hotel, right there on the fourth floor that was our apartment, where we lived soon after the war. (A usual expression post World War II.) Today’s owners have added another floor, yet it’s still a walk-up. Barbara is my only remaining woman friend in Hamburg. She used to live in the building next to ours. We enjoyed poking around the 24-hour exclusive Nivea store and purchased a few creams and lip balm, then headed back to the Rathaus station in a circular walk. At a Tchibo store and bar, an equivalent to Starbucks, we enjoyed a most delicious hot chocolate. It was again a spritzy-rainy day, typical weather for Hamburger. 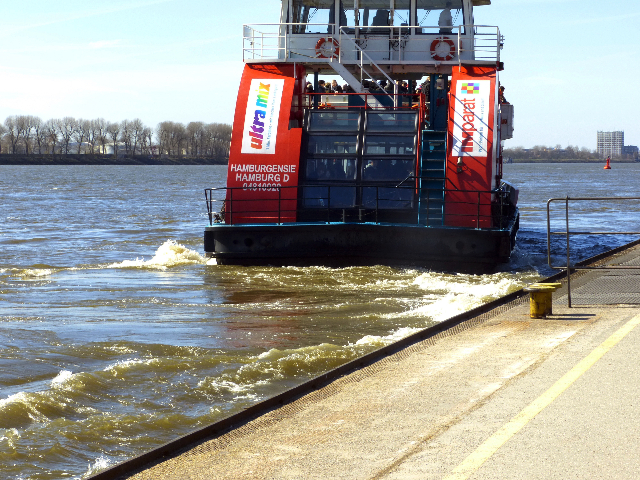 Lena felt better today and so the four of us went back into town, this time to the Landungsbrücken stop, the center of the harbor, along the river Elbe. 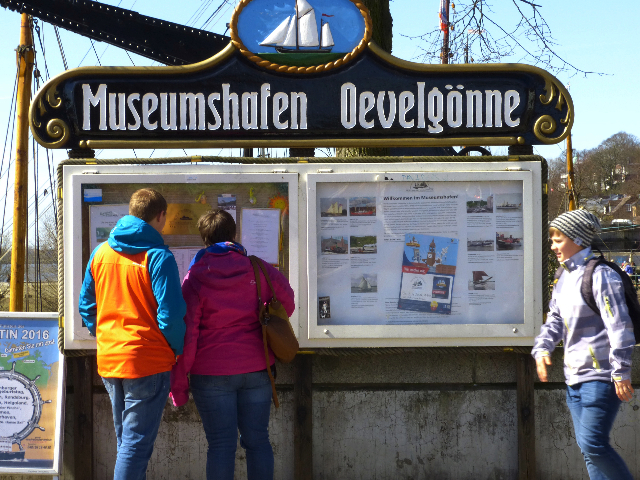 As we were crossing over to a board-walk, we noticed a beautiful old schooner, anchored to the left of us, then soon the busy harbor took our attention along the historic Landungsbrücken, the early 20th Century floating dock, which is approximately 800 feet long. 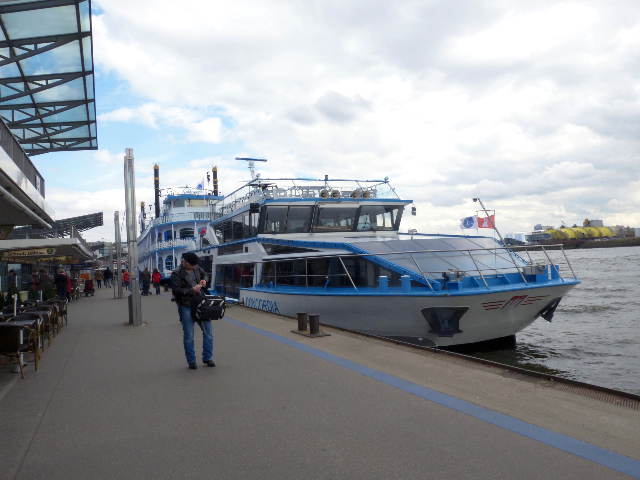 Ferries and tourist boats offering a Hafenrundfahrt dock on several landing position. It was lunchtime and we opted for one of the fish restaurants on the waterfront. 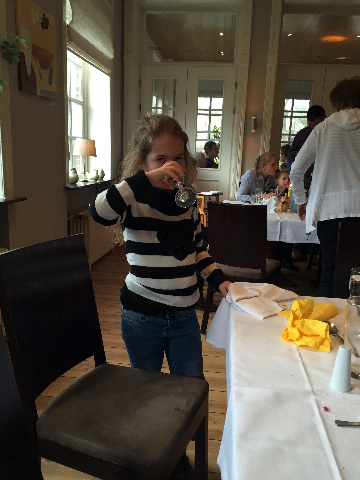 We ordered fish, of course, and enjoyed a traditional Scholle mit Speck (flounder with bacon) shared with Olivia. Delicious! Lena, still recovering, ate very little, yet Nola is always a good and adventurous eater. 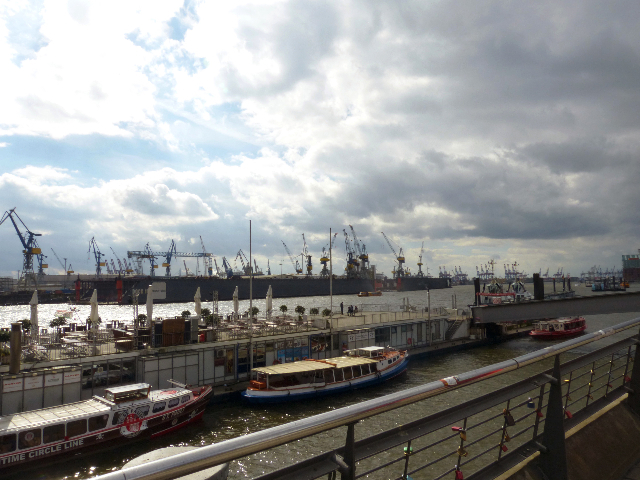 From our table at a large window we watched the busy harbor and across the Elbe a mass of cranes and ship yards, once a center, where huge oil tankers were built. 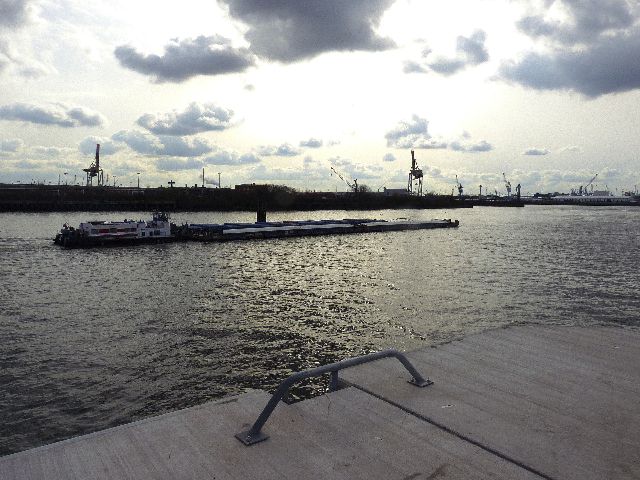 However, Hamburg harbor has developed into one of the largest Umschlaghäfen (goods distribution harbor) in Europe. 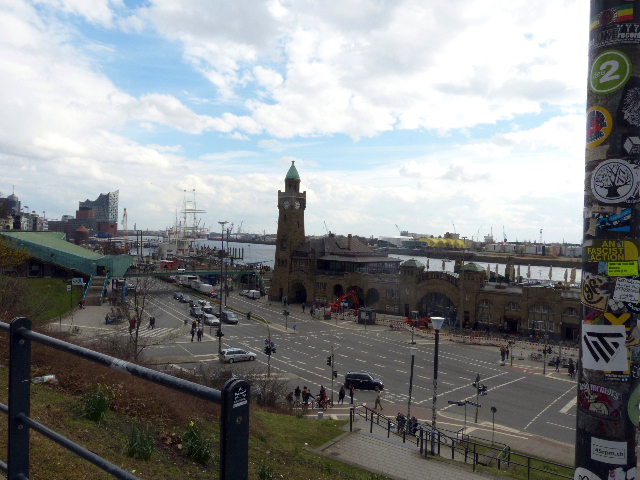 Then, along the piers we went to the Old Elbtunnel, which connects both sides of the Elbe underwater. It was inaugurated in 1907 for car traffic and until today a few cars still make the elevator trip. 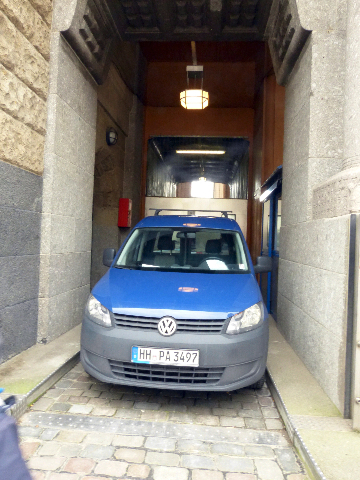 Of course, another new Elbtunnel opened in the 1975, where more than 100,000 cars zip through per hour. 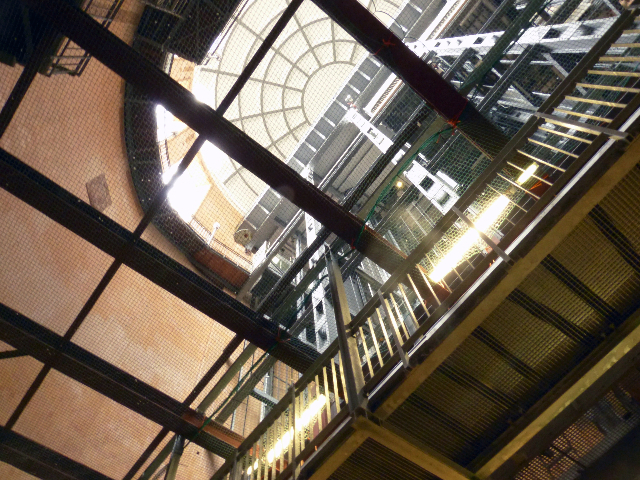 So, it was fun to take an elevator down to the two tunnels, or one could walk the iron stair case. We ventured into a tunnel along with many other visitors. 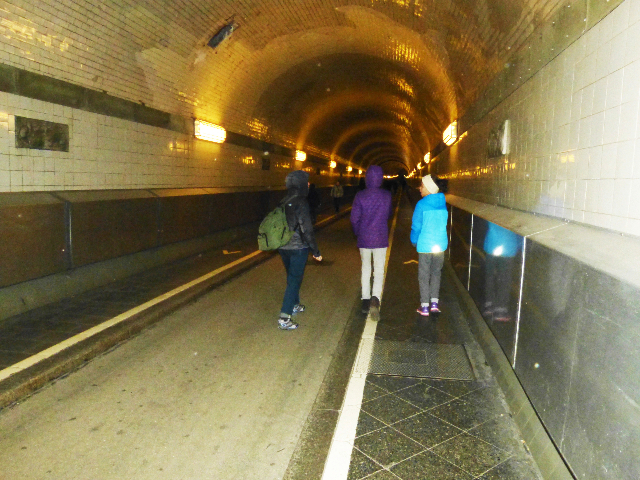 To walk the entire tunnel would take 20-30 minutes one-way, a bit too far for us; yet we thoroughly enjoyed the experience. A few cars drove by very slowly, pedestrians now rule. Looking up many stories high from within the large lobby area one can appreciate the beautiful craftsmanship in steel, iron and wood. 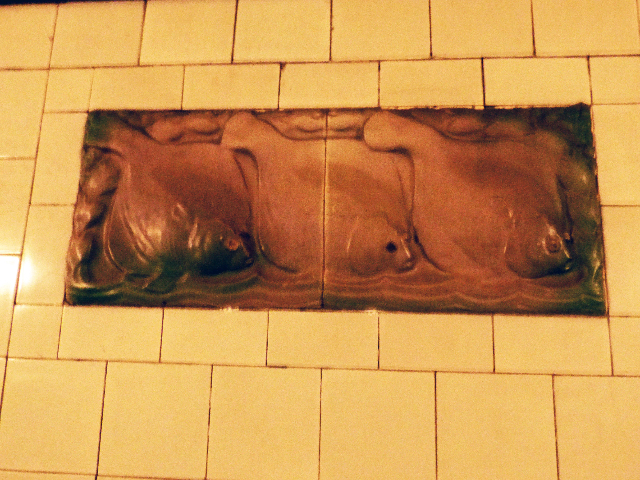 The tunnels are covered with tiles, some decorated with fish and lobster images or oddly rats, surrounding a tall boot. We returned to street level by one of four car elevators, walked across to an embankment and up 50 steps from where once more a frenetic harbor lay far below us. When we arrived home, our hosts had prepared a good-bye-dinner, which everyone enjoyed immensely. 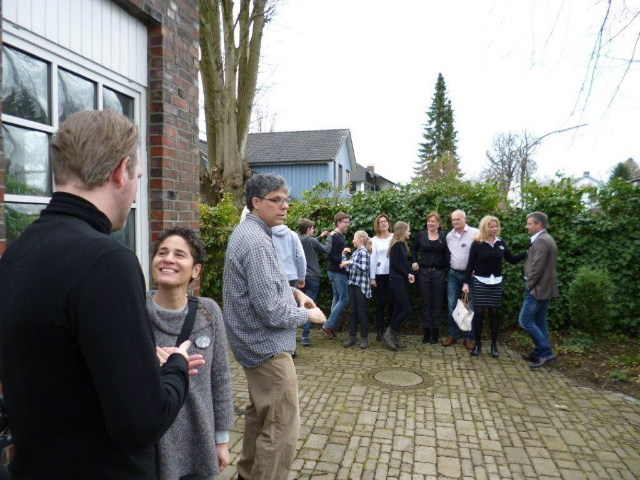 Dirk, Claudia, Kai and Mareike and their girls were marvelous good hosts. A week has gone by so very fast! 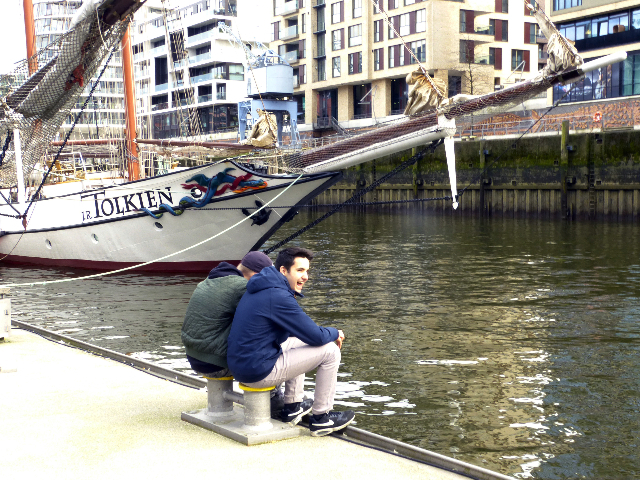 Arnö, my brother, Thorsten and Traudel arrived at 9 am to collect me with all my memories and luggage, and I would spend the last two days in Hamburg with them. We had tears in our eyes when saying good-bye. 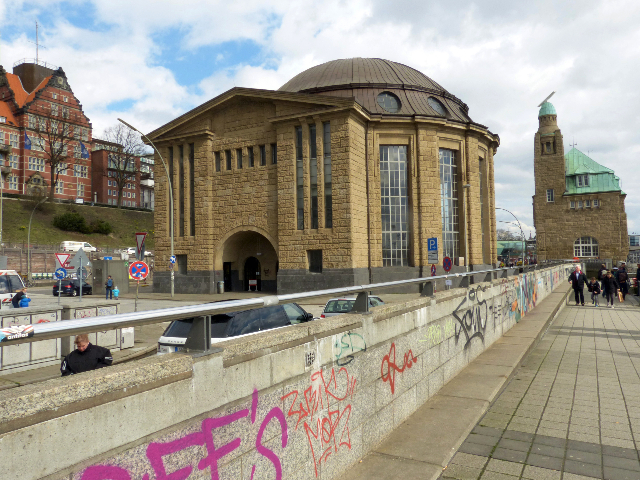 Dirk drove the Ungvarsky-Smith family to Hamburger Hauptbahnhof, the central railroad station. Oops, they returned within five minutes, Olivia had forgotten her cell phone, a quick and lucky discovery! 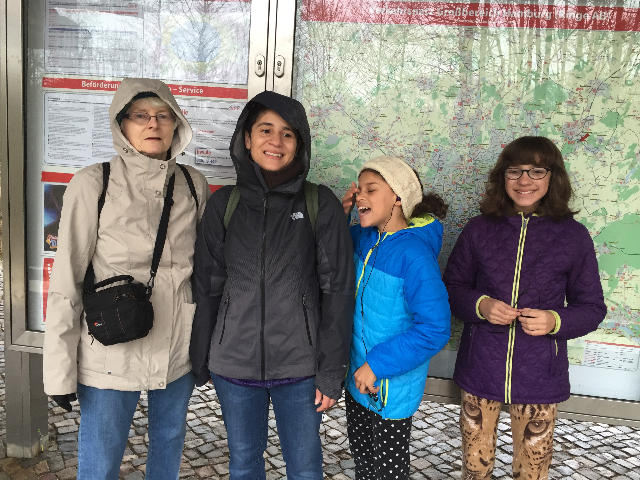 The family watched parts of northern to central Germany pass by their windows during the five-hour train ride to Heidelberg, where they would spend their remaining days with friends. 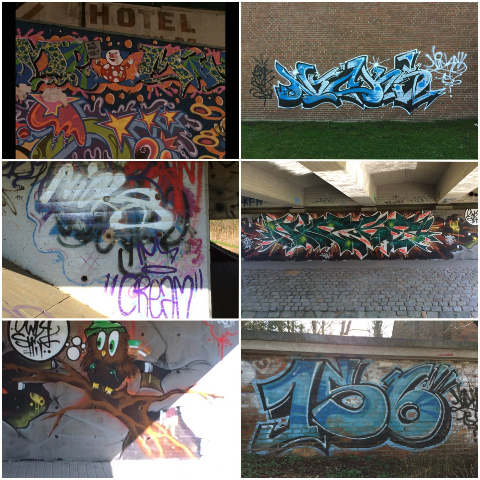 More adventures awaited them, which included a day in Strasbourg, France. Of course, they would also discover the picturesque town and Heidelberg Castle. 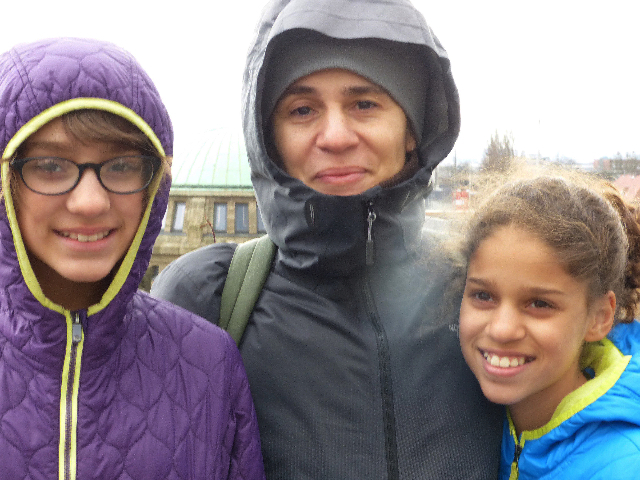 The family flew back home on Monday, April 4th, from Frankfurt. For us meanwhile, Traute had planned a trip to the famous Fischmarkt area, where we had a most delicious lunch in a funky fish restaurant, with a famously word-to-mouth reputation. Many foreigners, me included, sat on long tables together. Arnö and I shared the biggest pile of mussels, what a delight! 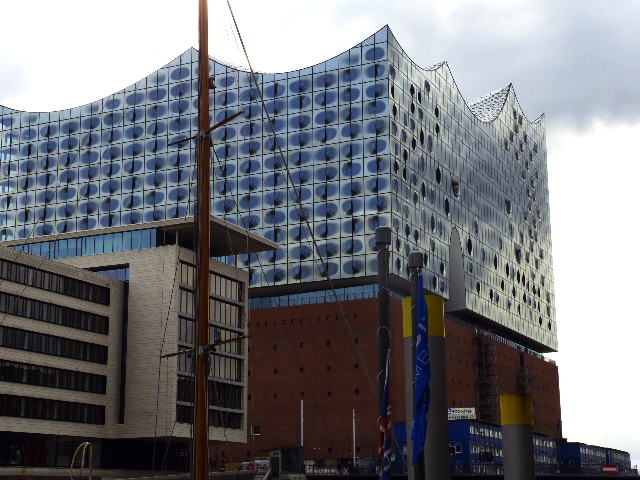 At my request we drove to the Speicherstadt and Neue City, where the Elbphilharmonie is situated. 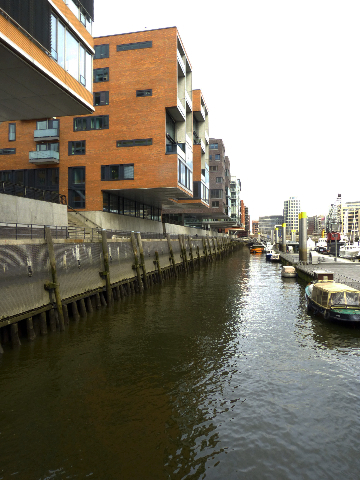 We explored docks and the new apartment houses overlooking canals, where prices are astronomical, we hear. Finally, my first night of sound sleep. 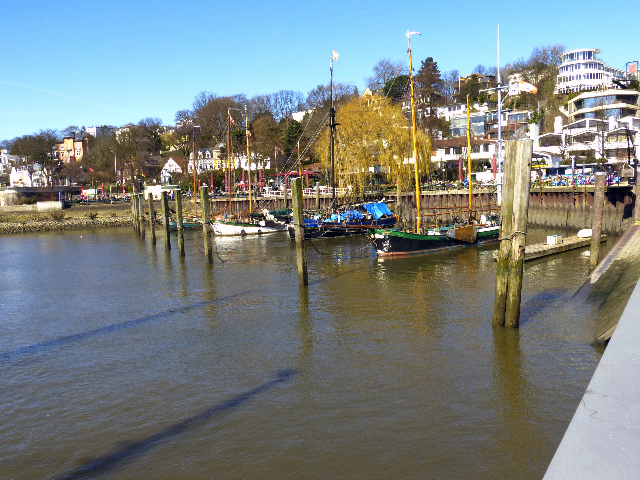 Bärbel, my dear woman friend, had another surprise for me on Friday: A trip to the old boat harbor of Övelgönne, along a more northern part of the Elbe. Again, tall cranes on the opposite side dotted the skyline. We were actually looking at Hamburg’s Umschlaghafen, where containers are moved from arrival to distribution point. Visitors can only venture there in the evening on tours. Specially trained personnel, sitting high above the action in glass cabins, move containers from ship to ship to train to storage, hardly with other human interaction. Barbara had just gone on a very interesting tour and spoke about the near ghostly activities. It was a warm, sunny day, perfect for a first long walk along the beach. 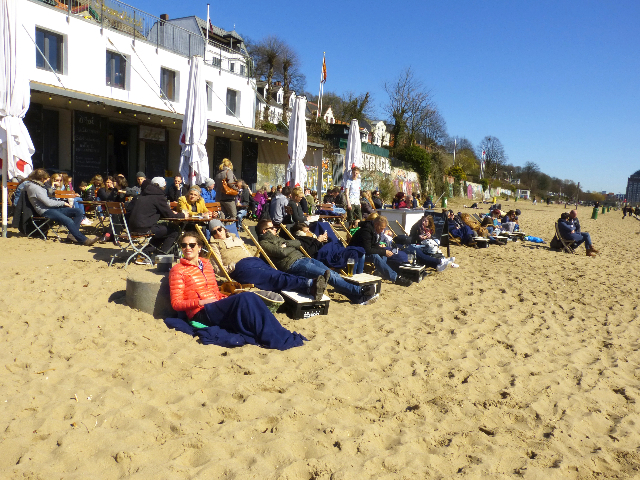 Many people, still in coats, were enjoying their first few hours on beach chairs. We found a less crowded restaurant along the water front; later walked back to the car by an area of old captain’s homes. 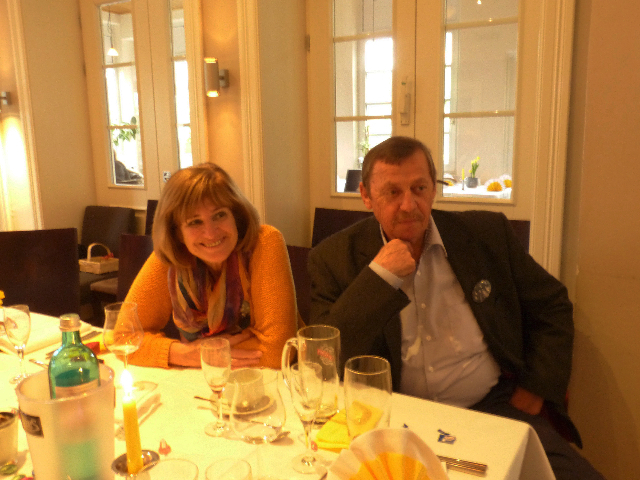 We made our way through Hamburg’s rush hour and I returned in time for an evening dinner. 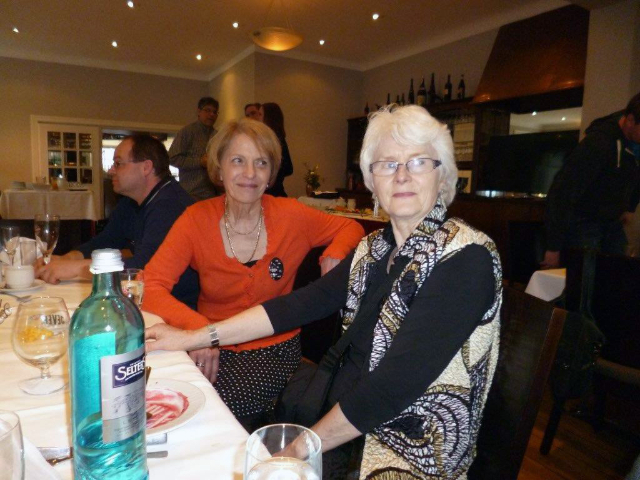 Cousins Monika and Gerhard Pott joined us four at Khans, a scrumptious buffet restaurant. We arrived early so there was a vast food palette to choose from. Prepared dishes and raw exotic meats, like alligator, kangaroo and different venison cuts, as well as various fish and prawns could be chosen for on the spot grilling. We closed the evening with most delicious deserts and more good-byes. I could not sleep past 3 am; Arnö and I had a final breakfast together. Then we arrived at the airport before 7 am for my early departure, back to Newark, New Jersey. From there onto Albany, New York. Much to our relief, all our travels concluded well at different airports and different days. My dear husband Charles, whom I owe much, was there to welcome me. Das erste Photo ist ein Button, made in America, und sie reisten mit mir in meinem Koffer. Da waren genügend Buttons für alle Teilnehmer an dem Familietreffen und gedacht als Erinnerung daran daß die Hartmann Familie unsere Vorfahren sind. Wir hatten eine aufregende Nacht. Lena (10 J. ), war während der Nacht um 3 Uhr krank geworden und Olivia und ich wuschen Wäsche und Betten so schnell wie möglich. Zuerst überlegten wir, wer wohl mit Lena zu Hause bleiben sollte, oder, wer mit ihr früher vom Familientreffen zurückfahren konnte. 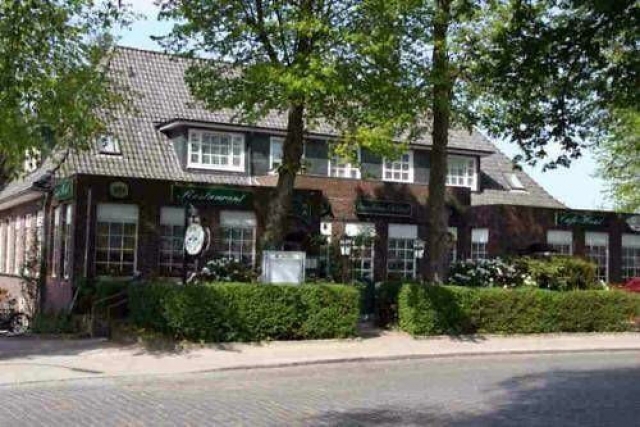 Glücklicherweise erinnerten wir uns daran daß das Restaurant zu einem Hotel gehört, und somit reservierten wir ein Zimmer für ein paar Stunden. Das war die bessere Lösung! 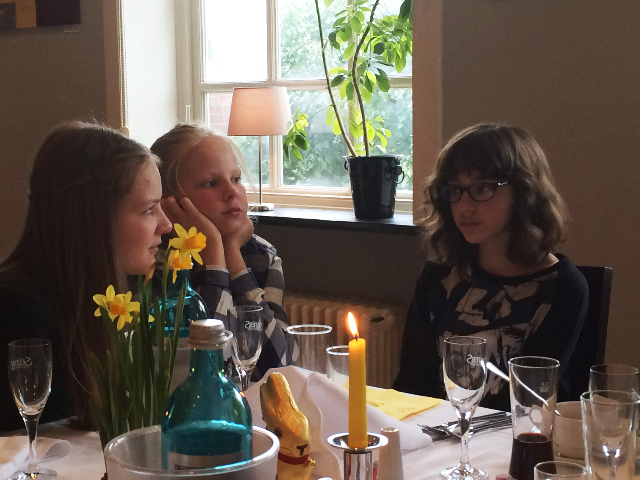 Um 10:00 fuhren wir zum Landhaus Ohlstedt, wo der Familien-Brunch stattfinden sollte. 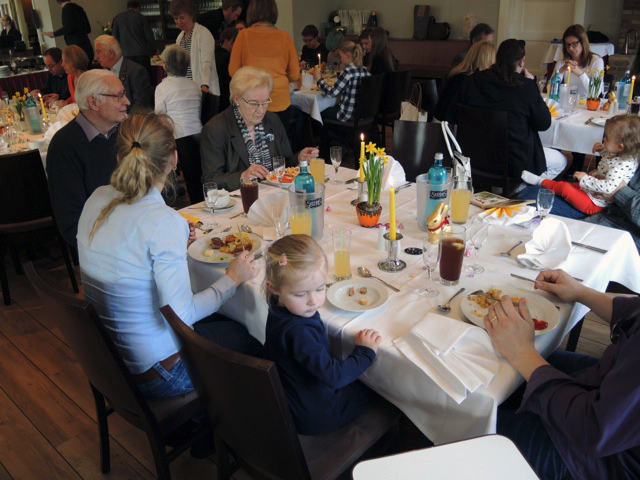 Der Raum, das Buffet und die Tische waren reizend mit einem Osterthema arrangiert, zu dem wir amerikanische Ostereier gaben und Barbara Müller, meine Freundin seit unserem zweiten Lebensjahr, brachte noch Osterhasen dazu. Plötzlich kamen alle Familien zur gleichen Zeit an, mit großen Hallos und Umarmungen. Wir verteilten die Buttons in der Hoffnung, uns alle symbolisch zusammen zu bringen. Es schien erfolgreich zu sein. Von der Hartmann Familie von 1936 hatten nur die Mädchen Kinder. Die zwei älteren Jungen, Otto und Horst, starben im 2. Weltkrieg und der jüngere, Günther, heirate doch ohne Kinder. 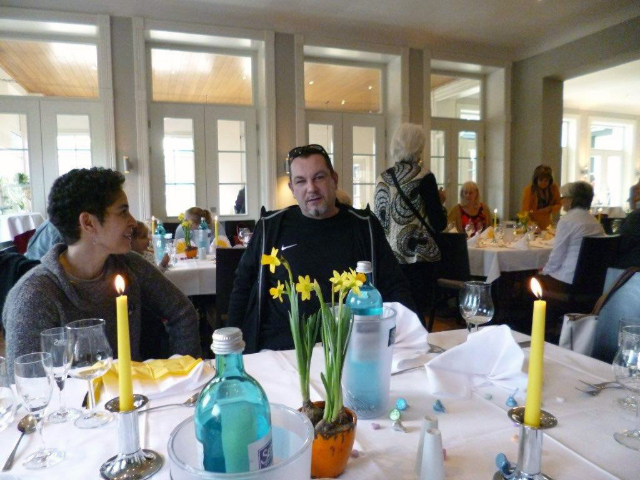 Nur Margot, die Jüngste in dem Foto, die auf dem Schoss ihrer Mutter Dora sitzt, lebt noch. Franz Hartmann, mein Großvater, ist links auf dem Bild. Die anderen zwei jungen Frauen sind meine Mutter, Martha, links oben, die Arthur Hiemer heiratete und Gertrud, rechts, war mit Fritz Jonen verheiratet. Margot und ihr Ehemann Horst Müller, sind heute in ihren 80er Jahren. Sie waren unsere Ehrengäste und Margot ist in der Tat die Matriarchin der Familie. Der Hartmann Name ist leider verloren gegangen. Die nächsten Generationen haben weitere Namen angenommen oder wie ich und Britta unseren Familiennamen behalten. So kamen wir zusammen, vier Generationen mit dem Wunsch, miteinander und auch über den Atlantik hinweg unsere Verbindungen zu erneuern und zu vertiefen. Drei Stunden gingen sehr schnell vorbei. Wir hatten gebeten mit Familienmitgliedern zu sitzen, deren Bekanntschaften wir erneuern wollten, und so tauschten wir Plätze und Unterhaltungen flogen hin und her. Wir vermissten Ursel Hiemer, die Ehefrau meines verstorbenen Bruders, Winfried; Mira Hiemer, die Ehefrau von Detlef und Jaimie Hiemer, Thorsten’s 12 Jahre alte Tochter, das in Norwegen auf Schiurlaub war. Und, wie könnte ich nur meinen eigenen Mann, Charles Giuliano, vergessen? Er war zu Hause in Massachusetts geblieben, hatte jedoch viele Familienmitglieder während einer Reise nach Deutschland vor mehr als zehn Jahren kennengelernt. Etliche fotografierten eifrig und mailten mir ihre Bilder. 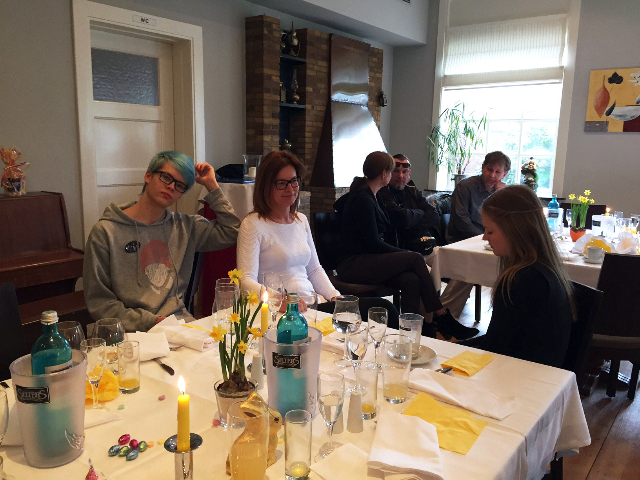 So ist die beigefügte Fotoserie vom Brunch ein gemeinsamer Erfolg geworden, ganz prima! Die kleine Lena wurde liebend von Claudia Müller und ihrem Vater Ed während der Feier betreut und sie nahm am Ende teil an dem neuen Familienfoto unserer Generationen, die nach Franz und Dora Hartmann kamen. Die beiden hatten zwei Weltkriege überlebt und 80 Jahre sind vergangen seit dem Hartmann Familienfoto: 1936 - 2016. Lena, noch nicht ganz gesund, blieb mit Ed zu Hause und somit fuhren Olivia, Nola und ich mit der U-Bahn wieder in die Stadt und stiegen am Rathausmarkt aus. Hamburg’s imposantes Rathaus war am Ende des 19. Jahrhundert wieder erbaut, nachdem das Große Feuer von 1842 viel vom Stadtkern zerstört hatte. Es ist auf 4000 Eichenpeilen gebaut, ein viereckiger riesen Bau mit Innenhof. Hamburg ist schon seit dem 13. Jahrhundert ein Stadtstaat, und somit ist das Rathaus der Sitz vom Hamburger Parlament. Wir öffneten das schön verzierte Tor zum Rathaus, wo viele Menschen versammelt waren. Dann gingen wir in den Innenhof mit dem barocken Brunnen, trocken während der Wintermonate. Im Sommer finden im Hof intime Konzerte statt. 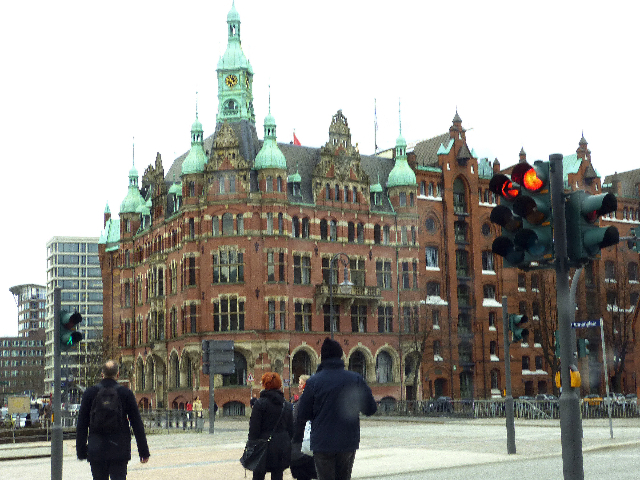 Rathaus und der Rathausmarkt bilden das Zentrum von Hamburg. Ich habe immer gern den Rathausmarkt besucht, wo im Laufe des Jahres Vieles gefeiert wird. Heute war der Rathausmarkt leer, leider haben wir noch immer kalte Wintertage. Dann ging’s weiter am Fleet und den Alsterarkaden entlang, hinüber zur Alster, Hamburgs großer See, der aus zwei Becken besteht, mitten in der Stadt. Während meiner Jugend gab es Winter, wo man den kleineren See, die Binnenalster, auf Eis überqueren konnte. 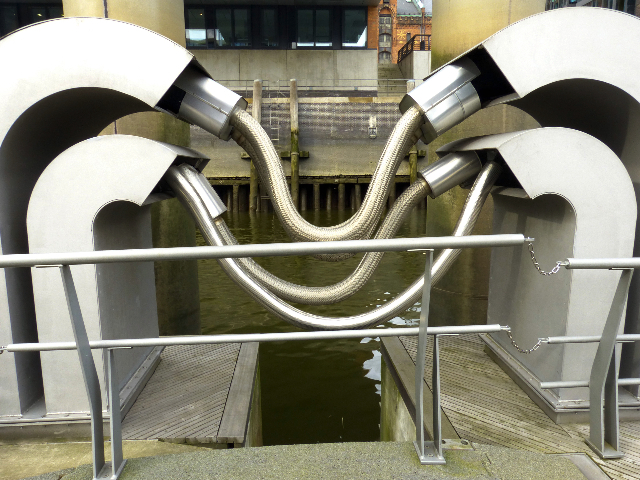 Ich fuhr auch mit einem Alsterdampfer vom Jungfernstieg zur Anlegestelle Atlantik Hotel, zu meiner Höheren Handelsschule. Und Jahre davor ging ich bei dem anderen Alster-Hotel, dem Vier Jahreszeiten vorbei, auf meinem Schulweg zum Gymnasium, die Sophie-Barat-Schule - oh so long ago! Wir drei liefen am Alsterpavillion vorbei, ein 200 Jahre altes Café und Restaurant. In dem Gebiet um den Jungfernstieg herum gab es immer schon viele exquisite Geschäfte und Kontorhäuser. Der nächste Platz ist der Gänsemarkt, wo ich aufgewachsen bin. Dort steht das Lessing Denkmal von Gothold Ephraim Lessing, Dichter und Theaterintendant im 18. Jahrhundert. Sein Theater stand auf dem Gänsemarkt. Ich zeigte auf das Gebäude neben dem Mariott Hotel, dort im vierten Stock wohnten wir seit Kriegsende. Die heutigen Eigentümer haben ein Stockwerk draufgebaut, doch es gibt noch immer keinen Fahrstuhl. 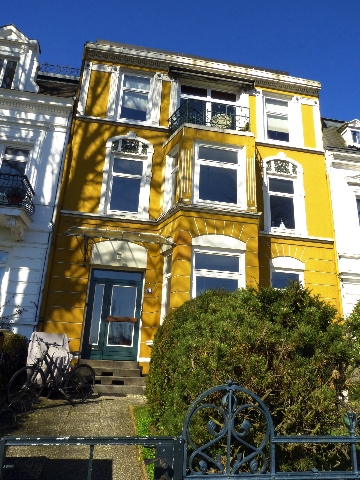 Bärbel, meine noch einzige Freundin in Hamburg, wohnte im Nebenhaus. 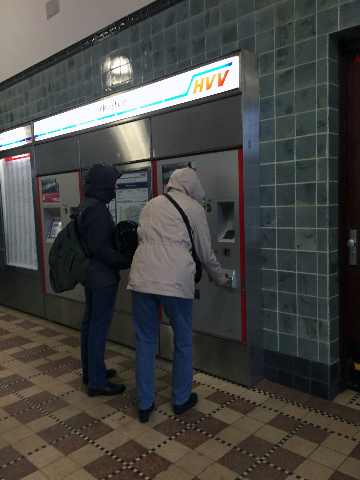 Wir hatten Spaß, in dem ausschließlich Nivea-Geschäft Kreme und Lippenschutz zu kaufen, und liefen dann zurück in einem großen Bogen zur Rathaus U-Bahn. In einem Tchibo-Geschäft und Bar gabs eine leckerte heisse Schokolade, denn es war ein typisch Hamburger Tag, spritzig und kalt. 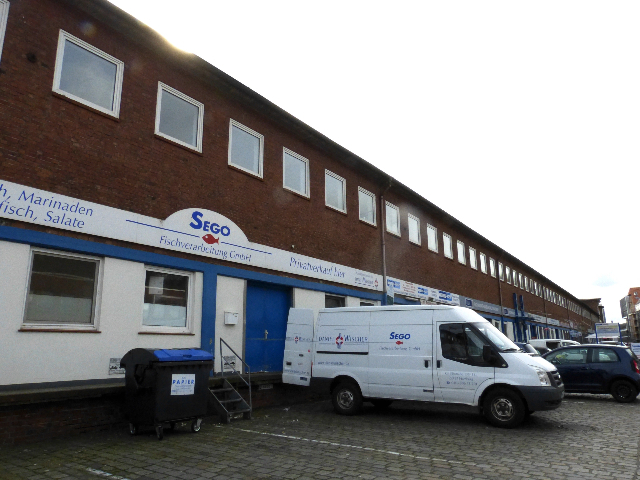 Lena gings besser und wir machten uns alle auf den Weg in die Stadt, dieses Mal zu den Landungsbrücken, ins Center vom Hafen. Links von uns war ein schöner alter Schoner geankert und bald schon liefen wir auf die historischen Landungsbrücken aus dem frühen 20. Jahrhundert zu, die ca. 700 Meter lang sind. Schiffe, wie Fähren und Hafenrundfahrten liefen ein und aus, ein richtiges Gedränge, und Schipper boten die Fahrten laut an. Es war Mittagszeit und wir entschieden uns für ein Fischrestaurant direkt am Wasser und bestellten, natürlich, Fisch. Olivia und ich teilten uns eine traditionelle Scholle mit Speck. Lecker! Lena aß wenig, doch Nola ist immer ein guter und abenteuerlicher Esser. Von unserem Tisch am großen Fenster beobachteten wir was im Hafen los war. Gegenüber auf der anderen Seite sahen wir eine Masse von Kränen. Riesen Öldampfer wurden dort früher auf den Werften gebaut. 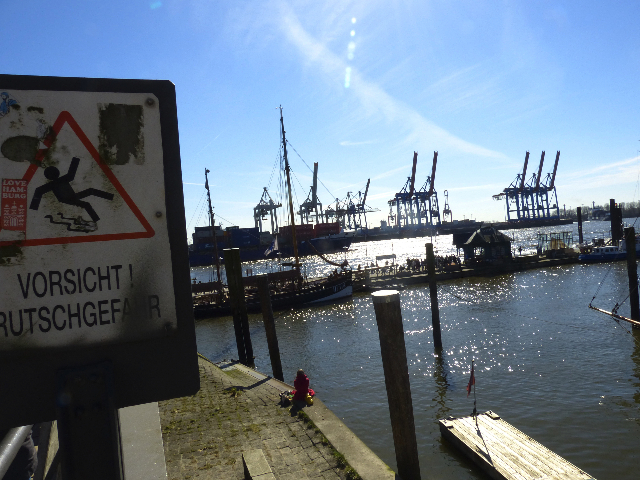 Doch der Hamburger Hafen hat sich zu einem der größten Umschlagshäfen in Europa entwickelt. Dann gings zum Alten Elbtunnel, der beide Seiten der Elbe unter Wasser verbindet. Der Tunnel war 1907 für Autoverkehr eröffnet worden, damals ein riesen Ereignis! Noch heute machen einige Autos die Fahrt per Aufzug zur anderen Seite. Seit 1975 gibt es einen neuen Elbtunnel, durch den mehr als 100.000 Autos per Stunde flitzen. Wir hatten Spaß, mit Fahrstuhl zu den zwei Tunnelröhren zu fahren. Man kann auch auf vielen eiseren Treppen nach unten steigen. 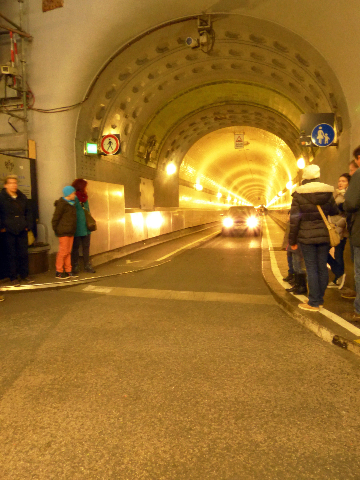 Mit anderen Besuchern liefen wir in einen Tunnel hinein. Es soll 20-30 Minuten dauern, um das Ende zu erreichen; das war ein bischen zu weit für uns. Doch es machte Spaß und ein paar Autos fuhren sehr langsam an uns vorbei. Heute gehört der Tunnel den Fußgängern! Von der großen Auffahrtshalle kann man die mächtige Höhe und Qualität der Arbeit in Staal, Stein, Beton, Eisen und Holz bewundern. Die langen Tunnel sind mit Keramikplatten ausgestattet, einige mit Fischen und Hummer-Bildern versehen, und sogar Ratten, die an einem Stiefel nagen. Zurück zur Straßenhöhe mit einem der vier enormen Fahrstühlen. Dann überquerten wir die Straße und stiegen 50 Stufen hoch, um nochmals einen Überblick über den Hafen zu genießen, der unter uns lag. – Als wir zu Hause ankamen, hatten unsere Gastgeber nochmals ein sehr schönes Abschieds-Essen bereitet. 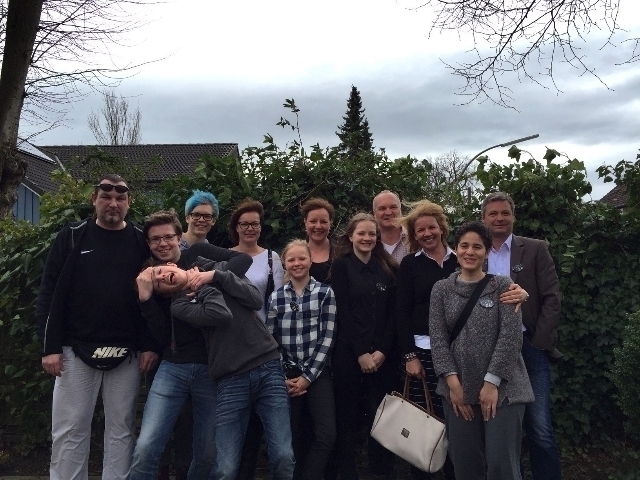 Dirk, Claudia, Kai, Mareike und die Mädchen waren einfach großartige Gastgeber. Wir sind ihnen für immer sehr dankbar. Eine Woche war so schnell verflogen! Arnö, mein Bruder, Thorsten und Traudel kamen früh an, um mich mit meinen vielen Erinnerungen und Gepäck abzuholen. Ich verbrachte die letzten zwei Tage bei denen. Mit Tränen in den Augen sagten wir Auf Wiedersehen, und Dirk fuhr die Ungvarsky-Smith Familie zum Hamburger Hauptbahnhof. Oops, fünf Minuten später waren sie wieder zurück, Olivia hatte ihr Handy vergessen. Glücklicherweise war es schnell entdeckt! Sie hatten Gelegenheit, Städte und Landschaften von Nord- und Zentral-Deutschland auf einer fünf Stunden langen Fahrt nach Heidelberg zu sehen. Mit Freunden verbrachten sie ihre letzten Tage in Deutschland, wo weitere tolle Erlebnisse auf sie warteten, einschließlich ein Besuch nach Straßburg, Frankreich. Natürlich entdeckten sie auch die reizende Stadt und das Schloss von Heidelberg. Die Familie flog am 4. April von Frankfurt zurück nach Washington, D.C.
Für uns hatte Traute in der Zwischenzeit eine Fahrt zum berühmten Hamburger Fischmarkt geplant, wo wir in einem ‘funky’ Fischrestaurant zu Mittag Pause machten. Offensichtlich sehr bekannt, denn wir saßen mit etlichen Ausländern, mich eingeschlossen, an langen Tischen. Wir teilten uns eine riesige Portion von Muscheln, ganz herrlich! Ich wollte gerne wieder die Speicherstadt und die Neue City besuchen, wo die Elbphilharmonie noch dieses Jahr eröffnet werden wird. Wir schauten uns um, wo neue moderne Wohnungshäuser über den Fleeten hängen und die Mieten und Kaufpreise astronomisch hoch sein sollen. 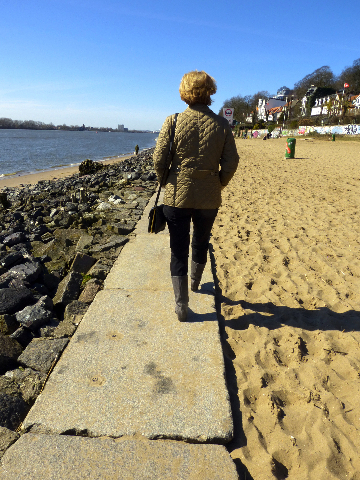 Am nächsten Tag hatte meine Freundin Barbara eine andere Überraschung für mich, nämlich Övelgönne, nördlich an der Elbe. Wiederum Massen großer Kräne an der anderen Seite, denn wir waren auf der Höhe vom Umschlaghafen, wo alle Kontainer umgeladen werden. Besucher gibt’s dort nur abends mit Führungen und Barbara hatte gerade eine solche Tour gemacht. Hoch in Glaskabinen sitzen Personal, die speziell ausgebildet werden, um Kontainer von Schiff zu Schiff zur Bahn oder Speicher zu dirigieren. Dabei gibt es sonst kaum mehr andere menschliche Arbeitskräfte. Ganz geisterhaft! Es war ein herrlich sonniger Tag, reif für einen ersten Spaziergang am Strand. Viele Menschen saßen noch in Mänteln gehüllt auf Stühlen am Strand. Wir fanden ein ruhiges Restaurant direkt am Wasser, um die Umgebung zu genießen. Später liefen wir an einer Reihe alter Kapitäns- und Lotsenhäusern vorbei und dann zurück zum Auto. Wir kamen in den Hauptverkehr, doch noch zeitlich zurück für unsere Abendverabredung. Cousine Monika und Ehemann Gerhard Pott trafen uns Hiemer in einem sehr interessanten Restaurant, Khan, ein mongolisches Buffet. Wir hatten eine frühe Reservierung und somit riesige Auswahl von vorbereiteten Spezialitäten. Rohes, exotisches Fleisch und Fischsorten, wie Alligator und Kangaroo, konnten dort gegrillt werden. Mein Regenbogenfisch hatte tatsächlich verschiedene Hautfarben. Der Abend ging mit süßem Nachtisch und erneuten Good-Bye zu Ende. Ich konnte nach 3 Uhr nachts nicht mehr schlafen und so kamen Arnö und ich schon vor 7 Uhr am Flughafen für meinen Flug nach Newark, New Jersey, an. Danach noch ein kurzer Flug nach Albany, New York. Mit großer Erleichterung schlossen wir alle unsere Reisen an verschiedenen Tagen und verschiedenen Flughäfen sehr gut ab. Mein lieber Mann Charles, dem ich viel verdanke, erwartete mich gern am Flughafen. "So glad you shared this. Lovely. Do not have anything to add which hasn't already been said, but thank you for taking us along on your journey! Can't wait for more! Wunderbar, Astrid Danke!" 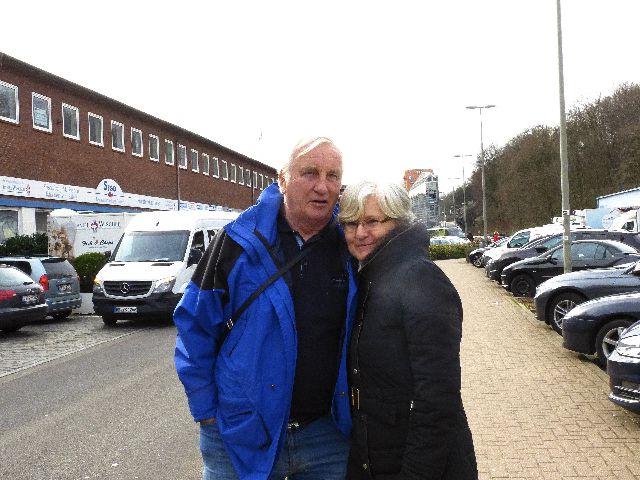 "I enjoyed reading about your family and Hamburg in part II. Thanks. Wilma, too." 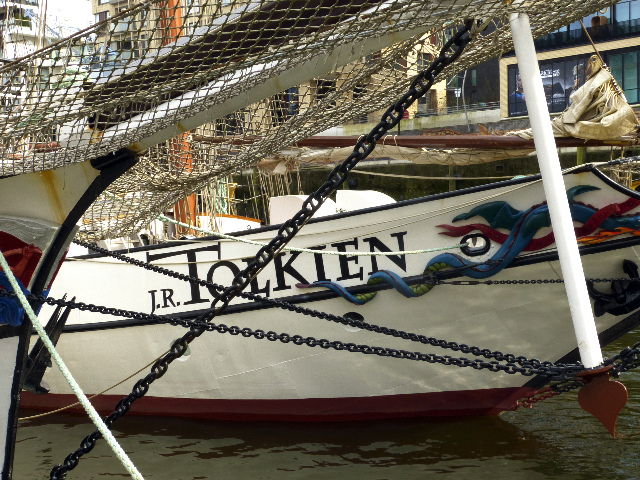 "Astrid, it is marvelous that you arranged this joyous family reunion for all to cherish. How touching to see the different generations proudly wearing the photo pins you had thoughtfully made, sharing their heritage. 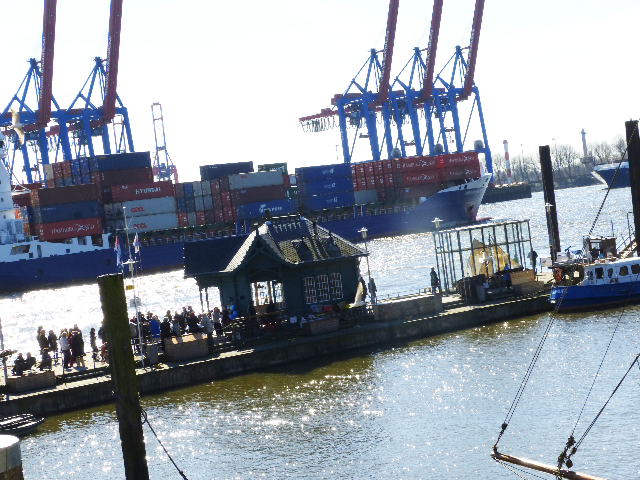 Hamburg has many charms, which you have beautifully illustrated. Thank you for taking us along on your journey." "I wanted your journey to continue! Thanks for letting me tag along....."